I could eat granola forever. It travels well. It is healthy if prepared right and made with the right ingredients. And it is downright delicious. I’ve made my own in the past, but sometimes…sometimes life gets crazy. And these past weeks have brought a lot of craziness and road time. And that means not a lot of time at home nor in the kitchen. Bummer. So, when I needed a granola to top off my fruit and Greek yogurt breakfast parfaits, I looked no further than some of my favorite, cleaner choices. Low in sugar, natural ingredients. That’s the key. My favorite brand wasn’t available at the store where I was shopping, but my another favorite brand was thankfully on the shelf. I love Kind products. Kind Bars are one of my go-to granola bar choices because they are gluten-free and really on the better end of the nutrition scale. And…a little bit closer to clean eating when you can’t make your own. Kind products have always been ranked high for me and I’ve had one other of their granola choices…and so many flavors of their Kind Bars. I felt confident choosing one of their bags of Healthy Grain clusters when I needed a granola. A good friend of mine, who I run with, brought me some fresh blueberries that he picked. I was thrilled to have them, as blueberries are one of my favorite fruits. I’ve been putting them on top of my breakfast banana splits after hitting the gym and this morning, I threw them into my fruit and Greek yogurt breakfast parfaits. Because…they are the best blueberries ever. 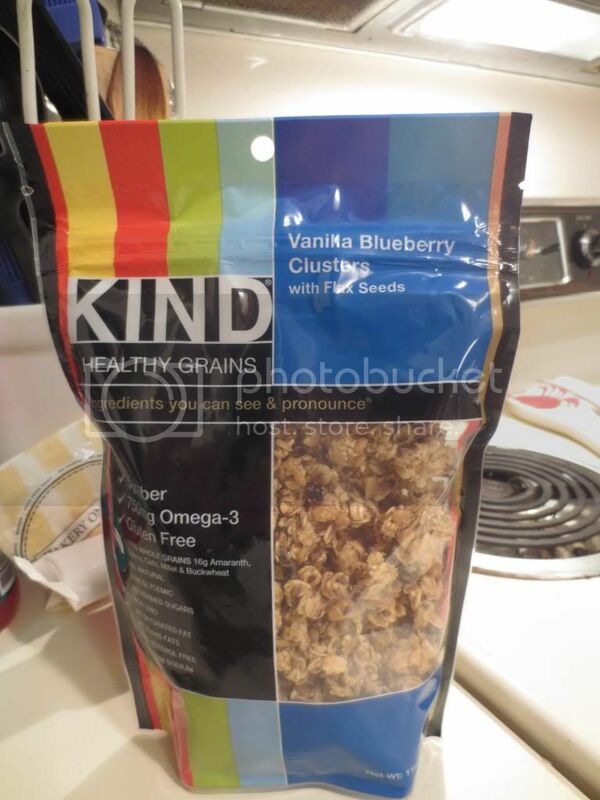 And, as luck would have it, the version of Kind Healthy Grains I chose at the grocery store was the Vanilla Blueberry Clusters with Flax Seeds. It was almost destiny. I actually liked this a lot more than I thought I would. First of all, because they don’t have a high sugar content, these clusters of whole grains (gluten free oats, brown rice, gluten free oat flour, buckwheat, amaranth, millet, quinoa) aren’t overly sweet and won’t dominate your palate nor the dish you are using them in. The vanilla flavor is subtle, without being lost. The berry flavor, according to the ingredient list, seems to be a combination of blueberry puree, apple puree, plum puree, and a bit of apple juice. In addition to that, the sweetness comes from the use of evaporated cane juice, vanilla, and molasses (which also helps as a binder for the clusters). And thanks to the inclusion of the flax seeds, additional nutritional value is added to a simple sweetened granola. Like I said, I adored the subtlety of this flavor and variety from Kind Healthy Grains. And for me, a gluten-free vegetarian, the fact that the flax seeds brings a healthy dose of Omega-3 is an added bonus. These are crunchy, and just add great texture to whatever it is included in. Even on its own, this granola is fantastic. Nothing needed to dress it up or add to it. I could eat it by the handful and be happy. Nutritionally speaking, I love how the ingredients are all natural. A serving size of this granola is 1/3 cup. In that serving, you get served 120 calories and 3 grams of fat. Not bad at all!! In addition, to being cholesterol free, this granola is very low in sodium (only 20 mg) and contains only 5 grams of sugar. Love that! A serving of the Vanilla Blueberry Clusters with Flax Seeds also provides 5 grams of filling fiber and 3 grams of protein. 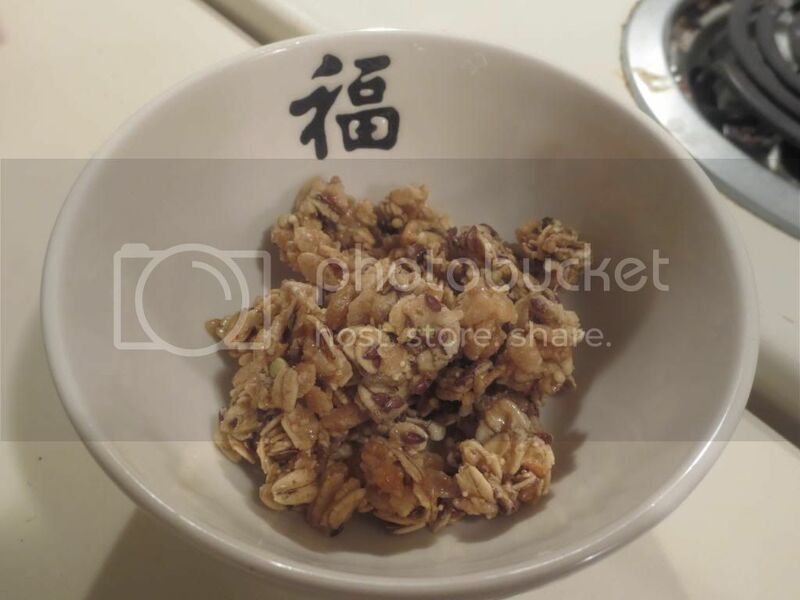 It is a really fantastic choice for granola. One that you definitely won’t feel guilty about eating or tossing over your yogurt, fruit, or whatever else you desire. When it comes down to healthy choices, sometimes granola can be tricky. So often it is just laden with sugars that make it an unhealthy, calorie-laden snack. But, thanks to companies like Kind Products, a healthier choice is available. If you are looking for a hint of vanilla sweetness and a bit of fruity goodness, I highly recommend the Kind Healthy Grains Vanilla Blueberry Clusters with Flax Seeds. Honestly…one of the best choices out on the market today. Available in regular grocery stores too. Trust me…you’ll want to try this one! 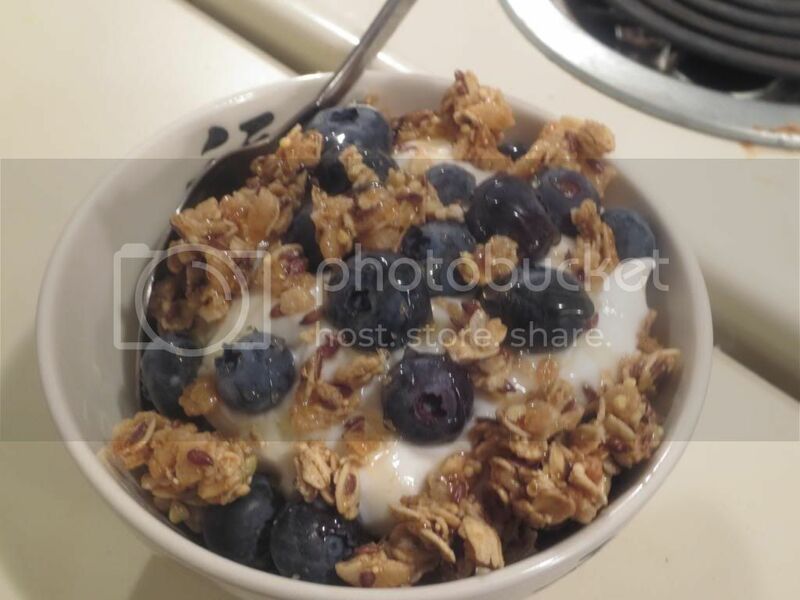 This entry was posted in Breakfast, Clean Eating, Food, Fruit, Gluten-Free, Granola, Nuts, Oatmeal, Products, Review, Snacks, Sweet Stuff, Vegan, Vegetarian, Yogurt by The Celiathlete. Bookmark the permalink. Does it have honey as an ingredient? No…honey is not listed as an ingredient.